Our latest advance in canine safety, the AceWatchDog™, connects to Hot-N-Pop® Pro and K9 Heat Alarm® Pro. This innovative device sends status information, warnings and alerts from the heat alarm directly to your Smart Phone, Tablet or PC with enabled internet browser. A proactive approach to ensuring the safety of your canine partner. 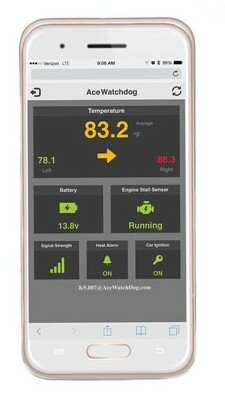 ACEWATCHDOG™ connects to Hot-N-Pop®Pro or K9 Heat Alarm® Pro and sends Temp and Vehicle status to your internet enabled smart phone. K9 DOOR POPPER® standalone remote door opening system. In addition to the systems we manufacture, we also represent the Havis Line of K9 Vehicle products and Tufloc secure storage solutions. Contact us for a quote on a complete canine safety and security bundle for your vehicle. 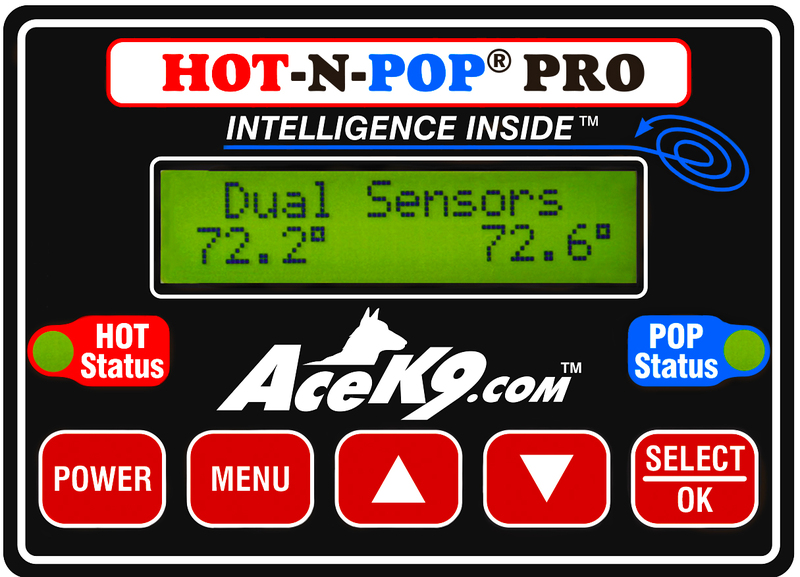 K9 HOT-N-POP® PRO is by far the most sophisticated combination K9 Door Opening and K9 Temperature Information System™ ever. K9 HOT-N-POP® PRO has Dual Temperature Sensors, Engine Stall Monitor™ and Vehicle Battery Sentinel™. 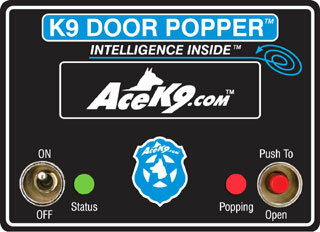 The K9 DOOR POPPER® has our microprocessor controlled Fast Pop™ System. With the press of just one button on the Remote Control, the door is unlocked, unlatched and Popped Open. !!! VIDEO - HOW TO SET CAR ON / MANUAL OFF in your unit !!! The system always Auto Powers ON when the ignition is turned ON and requires the handler to Manually turn the system OFF. At end of shift when the handler presses and holds the power button to shut down the system, an audible and visual warning to remove the dog is given and the system shuts down. If the handler turns off the ignition and just exits the vehicle, the system stays ON and keeps monitoring the interior environment for the K9. !!! VIDEO - No K9 Left Behind Live Demo !!! This feature keeps the system ON until the handler actually removes the K9 from the vehicle. At end of shift, when the handler turns OFF the ignition, there is an audible and visual warning reminding them to remove the K9. Only when they open the rear door where the K9 is located and remove the K9, will the system shut down. If the handler does not remove the K9, the system will continue to sound inside the vehicle and give a short honk of the vehicle’s horn a couple of times to remind the handler to remove the K9. If the K9 is still not removed, the system will stay ON and keep monitoring the interior environment for the K9. AceK9.com providing yet another layer of protection and peace of mind. 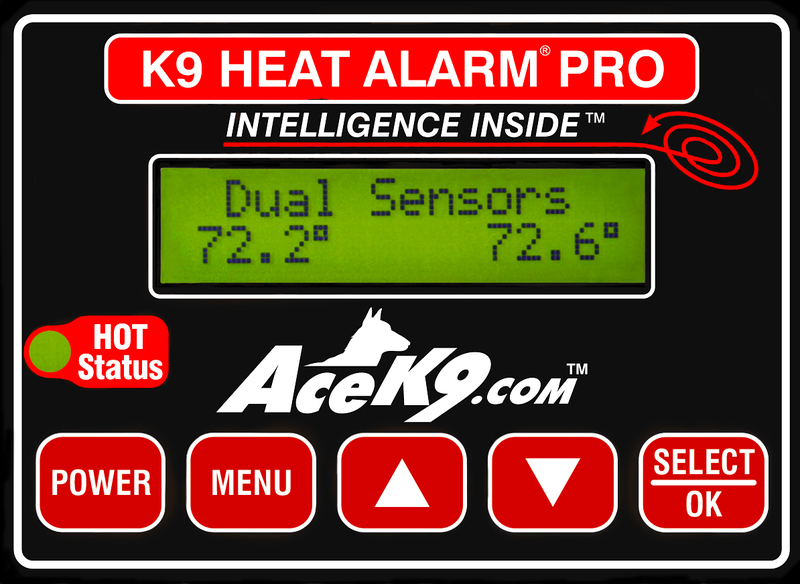 K9 HEAT ALARM® PRO Includes, AceK9 SOS™ special horn alert sequence, Siren Activation, Light Bar Activation, Dual Window Drop and "Forget Me Not" CAR ON / MANUAL OFF Feature. !!! VIDEO - HOW TO SET "Forget Me Not" CAR ON / MANUAL OFF in your unit !!! With the push of ONE button on the Long Range Remote Transmitter, the Fast Pop™ System Unlocks and then Pops Open the door. Truly the best standalone K9 deployment system available!